When you think of Nintendo, you can't go past the thought of Super Mario Bros. Mario in particular, started everything for Nintendo. Super Mario Bros on the NES was what shot Nintendo into the iconic world of Video Games. There's no doubt, that Mario is the most iconic video game character of all time leading generations of gamers since the 80's. As years went by and technology evolved, so did Mario. In 1995, we saw Mario hit 3D with Super Mario 64, and following that year we didn't see a 2D Mario game until nearly a decade later. On Nintendo DS in 2006, Nintendo released NEW Super Mario Bros, a re imaginated, NEW experience of the Mario we all know and fell in love with. The game went on to being one of the best selling games of all time and has become a staple in the Mario series releasing 2D Mario games every few years such as New Super Mario Bros Wii (2010), New Super Mario Bros 2, and in 2013: New Super Mario Bros. U for Nintendo Wii U. Of course, we all know the story of the Wii U by now if you've read my past reviews. As the Wii U fades away, Nintendo Switch continues to break records by having some of the best titles ever made which also includes sharing Wii U's best experiences that were never reached out due to poor sales. So here we are today in 2019 with a ported release of New Super Mario Bros U DELUXE! What's new? What's old? and of course... What's good? I'm pretty sure every New Super Mario Bros. game that released has the same story, and this is no different which is kind of a bummer. Once again, Mario, Luigi and friends are dining at Peach's castle with the princess when suddenly Bowser crashes the tea party and kidnaps Peach. 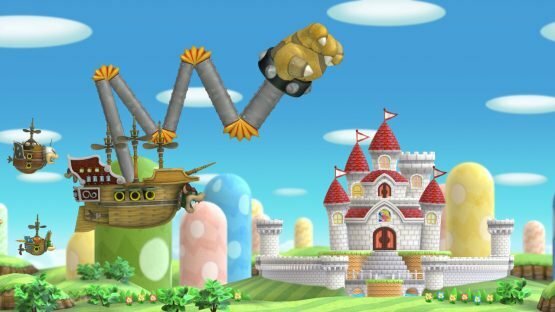 This time though, Bowser has the help from the Koopalings and his son: Bowser Jr. Mario, Luigi, Yellow Toad (Was blue in Wii U's version) Toadette, and Nabbit leave on their adventure to travel through 8 (+) worlds to rescue Princess Peach and stop Bowser from invading the Mushroom Kingdom! I'm not going to lie, as I said this story is a bummer. Even though it's the basic Super Mario story we've had since the 80's .... that's just the problem. It's getting stale, Peach who has proven many times that she can just save herself.... this story isn't working for me personally anymore. Nintendo plays it safe, and this is most of the game. Which I'll get to in the gameplay, but I wanted to get this out cuz I really hope someday Nintendo will decide to take a new twist on thr story. When this game released on Wii U, I feel all die-hard Mario fans were more than excited since this was the first time we saw Mario in HD. 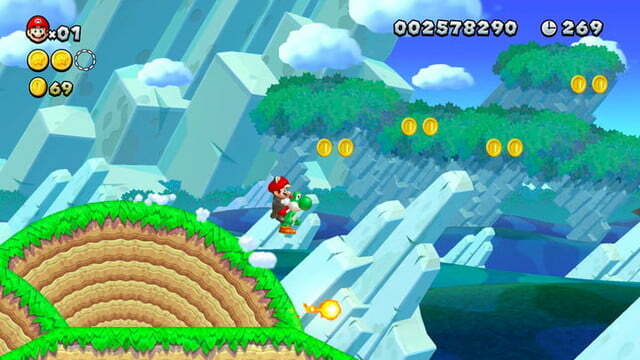 Don't forget, up until the Wii U Nintendo's consoles were not in HD which really turned down the quality in graphics. Though, as always they kept their charm with their stunning colors, vibrant and detailed views and original layouts which does not change in Deluxe. In this port, the graphics are identical to the Wii U's version, and 5 years after the original's release it's not that impressive. The grass is still, hills seem to be plastic and no facial expressions from any of the models on the enemies or main characters that you play. It's dull, especially that the characters in this game are all seemingly so small in such a large world with so much to look at, but a lot of times there's not really anything to look at. The sky is very bland and the backgrounds as well. I wish this port had a total makeover to stand up to 2019's look and feel of the current platformers, I feel it kind of ruined the mood and vibe of "lets play til the end!" as soon as I clikced level 1. I felt instead "I did this before... let's go again". I don't know what it is about Mario games, but when I hear his music... I can just tell it's Mario. Deluxe is the same thing, the New Super Mario Bros series has this style of music where an audience hums along and it makes the game feel alive. Enemies will dance to the beat of the music with the audience singing along. The atmosphere of the music always matches the environment that it's in. Grassy fields will be bubbly and jumpy, Castle themes are dark, mysterious that will effect you to maybe play more cautiously, and underground themes puts you back in the 80's but can also make you feel like you don't know what treasure you're going to find. Though, there isn't many tracks , most of the tracks are repeated depending again on the environment and I'm sad about this because of how good the music is. I wish there were more pieces, I would kill to put this on a playlist and just jam out and get me, or people in a good mood. Sound effects are perfect, the effects of running: hearing Mario's steps move through the environment he's in is welcoming . Jumping sounds tells you just how high you're reaching, and collecting coins, smashing blocks, or crushing koopalings is all so satisfying. Let me tell you, the sound effects got me through some pretty tough times like the Challenge Mode or certain Levels where I thought I would never get through a section, but the satisfying sound of collecting 1 Ups got me through. I have a LOT to say so prepare. bonus world: 9... oh my god you have no idea how many times I have died in this game LOL. 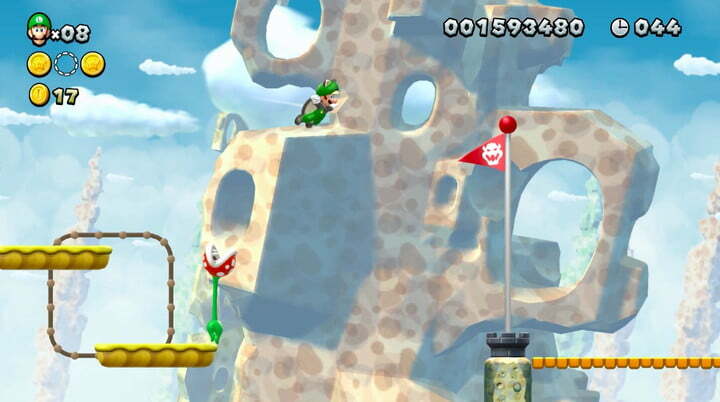 Levels can include being on a roller coaster, flying with baby yoshi, running from boos, etc. But this is also where I started to see some flaws in the controls, the characters play great but are very slippery, there's also the mistake before bouncing off an enemy high up that you can spin in the air by hitting the action button which can mess up your timing and causing death. This has happened to me over hundreds of times during my playthrough. Hitboxes on enemies are either too big, or small causing death or mis placements. When Nintendo makes their next Super Mario Bros. game (which we know is going to happen eventually...) I would for sure like the controls to feel more fluid and more natural to what we input on the controller. There's been times even where the joycons didn't respond on time to jumps, so this is something to look out for. Luckily, besides that there were no frame drops at all during the entire playthrough. Now let's get onto everything this game has to offer now that we spoke about the basics, there's 4 characters to play as that all has different traits: Mario is the all around character who runs, walks, jumps to victory. Luigi is more slippery than the other characters but can also jump higher than the other characters. In this version specifically, Toadette (replaced Toad in Wii U) is sort of an "easy" mode who can take the form of Peach (known as Peachette) with a Powerup. Peach can float, and get an extra jump making it easier for newer players. Finally, Yellow toad that replaced Blue Toad in Wii U, runs a bit faster which is great for speedruns. Finally, there's Nabbit which is literally God mode.... or for your 5 year old Brother or Sister. He's completely invinsible, he can't be hurt, burned, or can't die. There are of course powerups to collect to boost your character's power and help overcome bosses and level environments such as the Mushroom, Fire Flower, Ice Flower, Mini Mushroom, Acorn, Starman, Penguin Suit, Propellor, P Acorn, and the new Peachette Crown which of course, only works with Toadette. During your playthrough you'll be interrupted by several activities to change up the pace such as 1Up mini games where you need to collect as many 1 ups as possible, Mushroom houses to get extra items to store in your pocket in case you need it in a desperate time, and secret extra levels which can be accessed by finding secret exits in other levels! Let's now get onto the other modes, because we're pretty much covered everything in the main story mode! Luigi U is the DLC of the Wii U's version but comes for free on Deluxe. Luigi U is a playthrough of the main game with Luigi except, you only have 90 seconds, layouts are harder, and Star coins are more hidden. It's a speedrun mode basically using Luigi's special abilities. Let me tell you, this was the most enjoyable part for me. Those "easy" stages no longer were boring and because the stages were so short it didn't feel like a drag to play the game all over again especially when it's so different from the original run. It's exciting to make it to the goal in time while trying to collect everything, and Luigi's reactions are the best. This is for sure recommended to play if you own the title. This was the hardest thing I have done in ANY video game. doing the challenges themselves may not be the hardest.... but try getting them all in GOLD medals? Oh jesus sweet mary. By the way, there are 60+ challenges total. It takes time, practice, and patience. And after the 300th time, you stop getting angry at dying and start understanding that "this just isn't the time...."
New Super Mario Bros U Deluxe has something for EVERYONE. If it's speedrunners, those who want to play casual fun, completionists who want so much to collect they can't get enough, platformers, and challengers who think Mario games have lost their way and are too easy: this is the game for you. It has content that has kept me busy for hours, and for those who complained about paying full price for a port? You're missing out on one of the greatest ports. Peachette is fun, Nabbit brings in the family, and all the content available fills all that time and your 2D Mario needs. This is the best 2D Mario game ever made in my opinion, I have not played a 2D Mario game worth more of my time. Of course, it's not perfect. Slippery and unresponsive control moments can be improved, I'd like the graphics to be overwhelming next time to the point of my eyes bleeding out of beauty, and I want the adventure to feel fresh and something new. New Super Mario Bros U Deluxe, is something you can't miss out and even if you have played it, it may be time to visit it and ACTUALLY complete it. I have to say this game is perfect for 2 player. 4 player yes I can agree is chaotic, but you can't help but laugh and rage when you and your party mess up. What really surprises me is Toadette being playable and the super crown turning her into Peachette. Glad to see that she is becoming more relevant to the Mario Series. Also, am I the only one who wants to see a re-release of all the New Super Mario Games as one package on the switch? Kinda like Super Mario All Stars where you play the original games from the NES but as the SNES version in 16 bit. Anyway good review Kels, I'll get this game when hopefully there is a price drop.